Mrs. Adeosun failed to take part in the compulsory national service after university graduation, but later obtained a forged NYSC certificate with which she has taken up top profile government positions. Mrs. Adeosun is yet to comment four days after the exclusive report was published. The National Youth Service Scheme, which administers the one-year service, on Monday, released a vague statement that effectively confirmed the scandal. It claimed investigations were still ongoing. 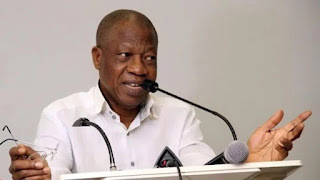 Pressed Wednesday at the presidential villa in Abuja, the Minister of Information, Lai Mohammed, said he had nothing further to add to the NYSC’s position. “I have nothing to add to what the NYSC has said. The NYSC is part of government and it has spoken,” Mr. Mohammed said.